This series of posts will be about the last part of the state I visited, southwest Florida. US 41 through Charlotte and Lee Counties, specifically. I wrote an extensive description of my first visit in April 2010. I made a follow-up trip the following year, to get those bits and bobs I didn’t get before. Now I’ll give you the whole kit and kaboodle, in one nicely wrapped package. Well, two. Note that this area contains one of the larger concentrations of National Wildlife Refuges in the state. Most are restricted to the public, as they are, you know, meant to be refuges for wildlife away from people. This part of the state was also hit hard by the collapse of the housing bubble. Couldn’t prove it by me, though. When I was there in 2010 and 2011, there was much hustling and bustling. No empty storefronts I could see, or forests of For Sale signs. They seem to be recovering now, so go and pump some money into their economy, eh? First off is Charlotte County. In a state with possum monuments and psychic towns and gravity defying hills and bat towers, the first stop on this trip is in a class by itself. And I’ve not seen it yet! I’ve gotten to most everything I wanted in that region, so I dunno when I’ll get around to checking it out. Maybe on the way back from spending a night in Everglades City. Oh, the quirky attraction, which I hope is still there? It’s in a Dairy Queen off I-75 at the Kings Highway exit. In one of their restrooms, to be specific. It’s the she-inal. Which is a urinal, for women. What a brilliant idea, right? Not so much. Someone came up with the concept in the ’90s, and they were installed all over the US. In Dairy Queens, primarily. They weren’t popular, though, so they gradually disappeared from DQ bathrooms. This one, near Port Charlotte, is one of the few left. Yep, another of those ‘only in Florida’ oddities that make me love my home state. Thank you, Lord, for making Florida so… abby-normal. 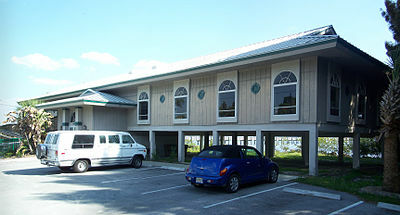 Next stop is a terrific place to learn about the counties’ past, the Charlotte County Historical Center. The lady there when I visited was very helpful. There are a goodly number of books and old photographs, so soak up all the history you like. Across the street is the site of the old Mott Willis Store. It’s one of the sad NRHP stories, since it was torn down only a year after being added to the Register. Many people labor under the misapprehension that National Register status protects sites from destruction. Not so. It mostly recognizes they’re worth protecting. It allows access to tax incentives for restoration and such, and can be used to promote a place to encourage preservation. But I’ve run across several buildings that have been demolished by man, not nature, after being added. Sometimes money from Uncle Sam can’t fix a problem, doncha know. From here, head southwest. You’re heading for Boca Grande, but there’s some stuff to see along the way. Like El Jobean. It was a housing development that never really developed. Just off El Jobean Road you can find two NRHPs, an old post office and old hotel across the street. The hotel is barely visible. Not because it’s far from the road, but because it’s horrendously overgrown. I’m surprised that any of it is standing. Unless someone takes an interest in the near future, it won’t be standing for much longer. The post office, on the other hand, is in use. There are some pictures of the area in one room, and the rest is a casual restaurant. I recommend the burgers. The one I had was yummy and decently priced. That and the fries held me over most of the way back to Ocala. About 3 miles down from the Don Pedro Island State Park shoreside entrance, take a right onto Boca Grande Causeway. Which will lead you, inevitably, to Boca Grande, which is in Lee County. It’s like several of the islands around here, where there’s a fee to get on them. Usually it’s around 5 to 6 bucks. Once you pay, you’re on your way. There are a couple more bridges you’ll cross, where you can see quite a few boats on the water. It is built up, but nowhere near as much as, say, Sanibel Island. After the bridges, you’ll be on a narrow two-lane road with a bike/walking path next to it. Eventually the road opens up a bit and you’re in Boca Grande proper. The historic sites are in clusters, so you’ll be doing the park-walk-drive-repeat tango a few times. But I don’t think you’ll mind, since there’s little traffic and adequate parking all over and it’s so darn quaint. Time to head back to the mainland, and Charlotte County. You want to catch US 41 south. Once you cross the bridge over the Peace River, you’ll be smack in Punta Gorda. In fact, you’re pretty much in the historic district. I’ll dwell on it in a bit, but first the outlying stuff. Now head back towards downtown. You’ll notice how little developed it is along here. I don’t know why, but it’s nice to see for a change. North on US 41 will get you back to the historic district. It’s moderate-sized, so you can’t just park the spot and walk the whole thing, unless you want to spend half the day doing so. Check the map link and decide your strategy. Parking is good, with some streets metered. On Retta Esplanade west of US 41, there’s a city park where you needn’t pay for parking. So if you want to do more walking then driving, park here and save yourself some money. It’s a pretty park anyway, right on the river, so it’s worth stopping at in its own right. There are also standard park facilities available, well-maintained. After you’ve been on as many roadtrips as I have, you find yourself being as happy to find clean public restrooms as interesting historical sites. File them away for future trips. Knowing where the bathrooms are will save you a whole bunch of leg crossing and feelings of desperation. If it’s open, you can visit the A. C. Freeman House, which has a history museum and Chamber of Commerce offices. Lots of useful info to be had there, I’m sure. I wasn’t particularly moved when I first visited Punta Gorda. It just seemed like a generic model for midsized Florida cities. The second time, though, I warmed up to it. The weather was as close to perfect as it gets on both trips, which helped. I also noticed how beachy it felt. It’s the architecture; quite a few houses along Retta Esplanade wouldn’t look out of place in Cedar Key or Fernandina Beach. Which is odd, since Punta Gorda doesn’t have beaches. Not even on the river. Otherwise, go south on US 41. In a little while, the buildings thin out. You’re not driving through protected lands, but it feels like you are. There’s mostly road and semi-prairieness for the next 15 miles. Enjoy, because after this there’s nothing but city driving. That’s it for Charlotte County, and a little bit of Lee. Next time, the rest of Lee. See you on the road! 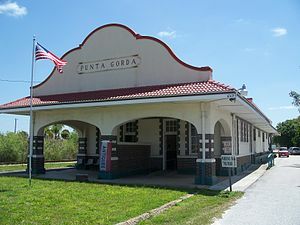 It didn’t take me long the find the Punta Gorda Atlantic Coast Line Depot (photos), at about 2. It’s a historical museum now. The weather was sunny, toasty and breezy. Great light for photo-taking, as you can see above. My next stop, Charlotte High School was the first school I encountered the whole trip that was in session. Perhaps appropriate, since it was the last school on my list. Thing is, there was an ambulance and police cars on the street in front. It may have been an accident, I couldn’t tell for sure. They were putting someone on a stretcher, and I could only hope things would work out. My access to the historic school building on campus wasn’t restricted by the hubbub, fortunately. I remembered that it had gotten severe damage in the ’04 and ’05 hurricane seasons, but you couldn’t tell. Whoever fixed it up did an outstanding job. I headed west in search of the A. C. Freeman House, but could find no sign of it. Moved, I hoped. I was happily right on that, as I discovered later. Going along La Villa Road, I saw a number of understated historic looking houses, enough for a historic district. Then it was some windy roads until I got to Shore Drive, where I easily found the Clarence L. Babcock House. After that, back to Punta Gorda proper, and the old ice plant. Got front and back shots, including a brick building in back which was likely where the ice was stored. That building is now a pub, open at 3 in the afternoon. Hmm. It wasn’t far to the historic district (street view). It’s referred to as residential, but the boundaries encompass most of downtown. I parked near a corner of the district and walked around the downtown area. Not all, but enough so I saw the H. W. Smith Building and the old First National Bank . The courthouse I liked especially, what a surprise. Back to the car by 4, and hunger struck. I staved it off with the ever-reliable Altoids. 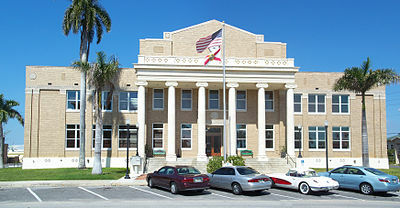 Heading for the Punta Gorda Woman’s Club, I drove right by the A. C. Freeman House. It must have been moved. Very nice condition, which figures since it’s now the home of the Chamber of Commerce. The women’s club parking lot was full. I was lucky to find a parking space, so I got out and took pictures as quickly as possible. Then I drove around the residential part of the district. Reminds me of the main historic district here in Ocala, but with fewer trees. I stopped at a city park on the edge of the district next to the Peace River. Did a recce for the next stage of travel. It was almost 4:30, and I knew I had only a few hours of good daylight left, and I did want to get home at something of a reasonable time. Options in mind, I departed, unlikely to return. I only missed a museum, and the city doesn’t entice me enough to draw me back. Over the Peace River bridge, I was in Port Charlotte almost immediately. I turned off the Trail, and reached the Charlotte County Historical Center. It was almost 5, which is when they close, but I got in and talked to a nice lady inside. She confirmed that the A. C. Freeman House was moved, as I thought. Also, the Mott Willis Store, which should have been across the street, had been demolished only a year after getting on the NRHP. Which just goes to show, being on the Register is no guarantee of permanent preservation. Got a pamphlet about the historical society for future reference, and was off. Once back on the Trail, I was in the thick of rush hour. It wasn’t completely horrible, but it did slow me down. My travel options were narrowing. I got off and headed towards El Jobean, which didn’t take too long to reach. I missed the road to get off at which would get me to the historic stuff. I u-turned and found the road. Yeah, I do a lot of u-turning. I get a workout when I travel, even while I’m driving. Two places on my list in El Jobean. An old hotel, about the size of a house, abandoned and surrounded by scrub bushes. Couldn’t really get a good shot of it, but took a couple anyway. More accessible was the former post office and general store (street view), which is now a museum and restaurant. It’s where I found out the origin of the town’s name. It’s not, as one might think, Spanish. No, the town’s founder, Joel Bean, created it by making an anagram of his name. I’d wanted to get to Boca Grande, but was too far, especially this late in the day (almost 6 PM). And even though sundown wasn’t until 8, the light was now not as ideal as I liked. Before I left, I got my third meal in an NRHP site. I ordered it to-go, though. Got a bacon cheeseburger, and I think the bacon was applewood, ‘cause it was sweet, with fries. About 7 bucks, and really good. I’ll have to go this way when I do make it to Boca Grande, and will have to remember this place for future reference. Good food, lots of it, decent prices, historic building, they’ve got it all. For me, this was the beginning of the end of the excursion, since I knew I wasn’t going to get many more photos. woman’s clubs throughout the state. I wonder if one architect designed several of them? I wondered if I’d ever reach Venice, but I finally got there about 6:45. I drove under a bridge to get to the Venice Depot. This was one of those occasions where late photo-taking worked out nice, since the near-sunset light gave a lovely golden glow to the depot. It’s also in very nice condition, thank goodness. There was an awful smell in the area, though. It wasn’t industrial. Maybe fishy? I had to hold my nose, it was so bad. I backtracked and drove over the bridge into downtown Venice, and no more smell. Downtown Venice was busy, and on a Tuesday night. I drove around a bit, but couldn’t easily find any of the stuff in the area I wanted to get pictures of. Since it was less than an hour to sunset, it wasn’t worth expending too much more effort, so I officially ended the photo-taking portion of the trip. After this, it was just heading home. I have to say, I like SR 681. It’s a 4-mile-long or so connecter between US 41 and I-75. It also has a nice long on-ramp that gives you plenty of time to get to speed to get onto the interstate. None of this 0-to-65 in no time like most of them. Heading north, it was smooth sailing. Not much traffic at all. I got to the Sarasota area by about 8, just around sunset. There was another half-hour of civil twilight and not long after that I was on familiar territory; I-75 around Tampa. The traffic was light, which was great. I thought about getting off to US 301, but figured that I was through what’s usually the worst part of the interstate around here, so I didn’t. Which turned out to be a big mistake, as the first theme of this trip reared it’s ugly head in a big way. I’d just got past the I-75/I-275 split, when suddenly the traffic slowed to a crawl. Fortunately, there was a rest stop coming up, so I pulled off. I accidentally went into the truck parking area, and since there’s no connection between it and the regular car area, I parked between two trucks. I got out and found the security guys, who told me there was a stretch of I-75 that had only one lane open. I don’t know if they were widening or repaving or what. Thing is, there shouldn’t have been enough traffic to make it a problem. I mean, why were all these people driving on a Tuesday night at quarter-‘til-9 going north out of Tampa, huh? They should be all home watching Dancing with the Stars. I called my cousin Paul and filled him in, then figured, what the hell. I was going to get a cup of coffee to wake me up anyway, why not a nap instead? So I got back to the car and let the seat back, cracked open the windows, and conked out about 9. When I felt better rested I looked at my watch and, lo-and-behold, it was 10:30. Yes, I’d napped for an hour and a half. The traffic looked immensely better, so I gave it a shot. It looked like it was thickening up as I got on the interstate, but it wasn’t too bad. Turned out the one lane portion was only about a mile, had to drive around 30 mph but was through it quick. Much clearer from then on, even though I ran into another one-lane stretch about a half hour later. There there was so little traffic, though, that I could go through at 50 mph and get past it in no time. I got off at the Lake Panasoffkee exit, as it was close to US 301. I was a little disoriented, since I’d never driven this part at night, but once I found US 301, I was on very familiar territory from that point on. I forgot about the construction of the bridge over the railroad tracks in Wildwood, and more in Oxford near the Villages. Dang, it’s not gonna be much fun at the begiinning of any southbound roadtrip for months. Finally, blessedly, I got home. At a quarter-after-midnight. Which should have been more like 10:30. Oh well, I got home safe, and had a good time (mostly), and that’s what counts. The whole trip was more than 850 miles, and I took over 1213 photos. Exactly one more than I took on my Easter trip in 2008. But that one was only three days long. So, not a record for me, but sort of one anyway. More travelogues to come. Not nearly as compendious, ‘cause they’ll only be for my usual day-long trips.